Happy Friday! Today I wanted to share with you all the new OPI collection inspired by Disney's new film, Oz The Great and Powerful, which opens today! I am really excited for this movie but am not sure whether I am going to have time to go see it in the theater or not... if you go, let me know what you think of it! This new SoftShades collection features three sheer cremes, three glitters and one new liquid sand. Sheer neutral beige. I found application on this to be a touch too streaky and balding at anything less than four coats. I actually originally swatched this with three coats but looking at my pictures I had to redo it. Looks lovely with four coats though and it applies easily so the four coats is not such a big deal. I also wasn't wearing a base coat so that might help a bit! Sheer whitish pink. This had the same application as Glints of Glinda, and similarly I felt like it looked a bit too balding and streaky at anything less than four coats. Again, base coat might fix that problem so I will let you know next time I wear it. This is a really pretty, refreshing color, perfect for spring. Sheer light pink. This one had no formula issues and applied great at three coats. I like this one a lot! Large gold hex glitter with medium and small silver holographic hex glitter in a clear base. By now most of you have heard or experienced first hand the problem with this polish - those gold glitters curl like tacos. Otherwise this is such a pretty glitter, but I can't take the curling. It's pretty bad. Just last night, OPI posted on their Facebook that they are looking into the issue, so they have heard us loud and clear on the taco glitter. It's too bad, because I would so love this without the curling. Perhaps they will fix it and re-release it? Haha, who knows! Shown is one coat over three coats of Glints of Glinda. A fun combination of holographic silver medium and small hex, bad, and microglitter in a clear base. Absolutely love this one! This applied really nicely with good, even coverage. Will definitely grab this again in the future. Shown is one coat over Don't Burst My Bubble. White and opalescent square glitters in a clear base. I love that we have some unique glitter shapes here, so much fun! This is a fun yet clean and elegant look, I actually worse this as a full manicure for a party I went to. Shown is two coats over I Theodora You. Shimmery bronzed brown liquid sand. This one seems to have a bit more of a fine grit to it than the Mariah Carey polishes, and as such doesn't feel quite as bumpy as they do (not that they felt all that rough either). It applied beautifully in two coats, and even when matte you can really see that shimmer in the sun! Of course, add top coat and the shimmer totally pops. Check out all that red and gold in the sunlight! For me, this collection contains mostly big hits and that one unfortunate miss. It is not often that I flat out don't like a polish, but personally I can't take the curling glitter of When Monkeys Fly. That said - there is a lot of other great stuff going on in this collection! The sheer cremes look really nice when you build them up a bit, and I am especially loving the pretty pink of I Theodora You. Both of the other glitters are bit wins in my book - they are both fun yet sophisticated and I could definitely wear them to work without any worry. I also love the liquid sand, although I do prefer it with a topcoat - of course, I am a sucker for gloss, so I prefer most things with topcoat! Overall the collection is very solid, and I am pleased that OPI has responded to our concerns about the glitter in When Monkeys Fly - it is great to know that they listen! Extra credit in my book. 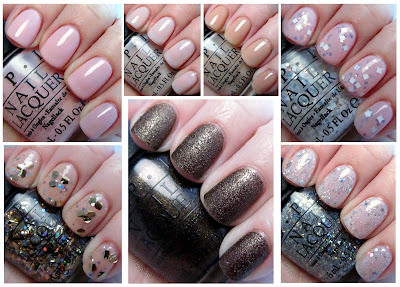 Which polishes are your favorites from the collection? Honestly, I am a little bit dissapointed with this collection but I am glad it's been released bacuse What Wizardry Is This? is my favourite nail polsh lately! My favorite is which is witch but they are all pretty. I like Which is Witch and Lights of Emerald City best. The soft shades collection just seems like a strange one to do Oz with since the movie looks so bright and colorful. I'm really wanting this collection,except for crazy tacos! 31 Day Challenge, Day 3: I Choose You, Pikachu!